Samyang has unveiled a new wide-angled and wide-apertured prime lens is its XP series. The new 35mm f/1.2 lens will be available for full frame Canon EF mount – for use for DSLRs such as the Canon EOS 5DS or the EOS 6D Mark II. The lens claims to be aimed to provide the quality needs by 50 MP or higher cameras, and future 8K filming. The metal lens incorporates 12 glass elements in 10 groups - including two aspherical elements, three HR high-refractive elements and one ED extra-low-dispersion element. It has a nine-blade diaphragm and a minimum aperture of f/16. 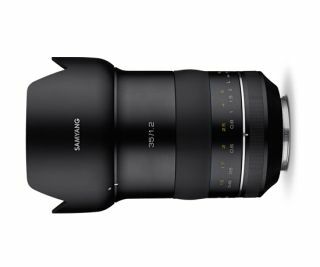 It has a front filter thread of 86mm, and comes with a petal-shaped lens hood. Minimum focus is 0.34m, which provides a maximum magnification of 0.17x. The lens is 117.4mm long, and weighs a hefty 1,106g – that's over a kilogram! The XP 35mm f/1.2 joins the XP 14mm f/2.4, XP 50mm f/1.2 and XP 85mm f/1.2 in the growing Samyang 'XPert' family of high-quality manual-focus-only lenses. The lens is due to go on sale in January for $999.